Steve Way and Amy Whitehead will run the marathon for England at the Commonwealth Games in Glasgow. They are the first members of England's athletics team to be named and increase the team's numbers to 69 across all sports. Way, 39, secured his place with a run of two hours, 16 minutes 27 seconds at the London Marathon in April. 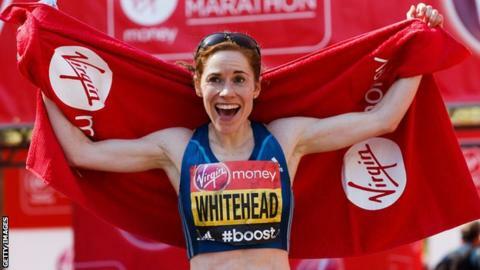 Whitehead, 35, will make her Commonwealth Games debut after clocking 2:34:20 in the same race. The full England athletics team will be announced on 9 June for the Games being held from 23 July to 3 August, with the marathon taking place on July 27. Way only took up running in September 2007 as a way of losing weight. "When I started my running "career" back in 2007 my only aim was to get fitter and thinner and feel better about myself," he wrote on his blog. "The concept of representing my country in a major games has only really been a pipe-dream so for it to happen now just as I officially turn into a over-40 veteran [three weeks before the race] makes it all the more sweeter!"